An Allied special-ops team monitoring Hitler’s largest supply of oil finds the traitor in their midst, but by then, a Fascist agent is the least of their problems. June 1944: As World War II rages, the people of Eastern Europe are hopelessly trapped between two formidable forces: Hitler’s Germany and Stalin’s Soviet Union. In their midst, a band of heroes prepares for the changes the coming battles will bring. Available in most LDS bookstores and several online retailers, including Amazon, Deseret Book, Seagull Book, and Barnes & Noble. 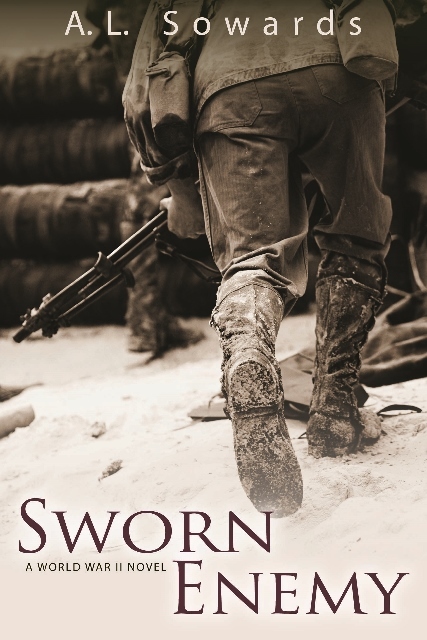 Sworn Enemy comes in paperback, audiobook (CD or MP3, narrated by Jason Tatom), and ebook. Here is the Sworn Enemy Pronunciation Guide. And Sworn Enemy Book Club Questions. You can request an Authorgraph here. Would you like to try a sample? The first two chapters are on Amazon. More information on the book is available in these blog posts. An entertaining tale of history, love and adventure that is taut and easy for readers to enjoy. . . A gripping and well-written story. This book is SO GOOD! It pulls you in on page one and keeps you going as you fight, fear, love, and conquer right along with the characters. I loved the action and adventure in this book. I really loved Genevieve and Peter’s characters, no matter the obstacle, they are able to overcome all things. I loved the war details in this book . . . I didn’t want to put this book down! The emphasis in Sworn Enemy is on the action and there’s plenty of that. The reader is shown the incredible risks undercover and resistance fighters took during World War II and the importance they placed on freedom and loyalty to their countries. More reviews are available on Amazon, Goodreads, Deseret News, Meridian Magazine, LDS Women’s Book Review, A Book A Day, Literary Time Out, LDS Writer Mom, and I Love to Read and Review Books. Published by Covenant, April 2013. Paperback ISBN: 978-1-62108-359-7; Kindle ASIN: B00CEKW49Y; Audio ASIN: 1621083608.